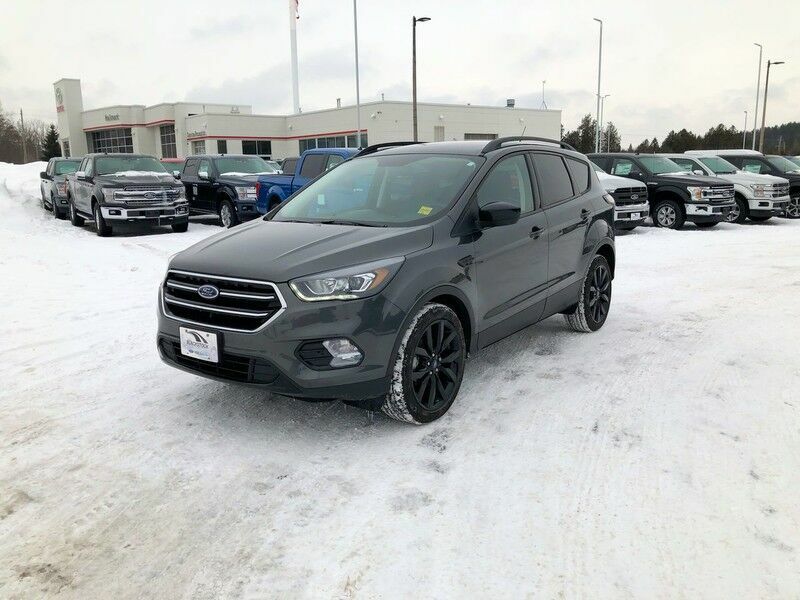 Add some driving pleasure to your day with our 2019 Ford Escape SE 4WD in Baltic Sea Green! Powered by a TurboCharged 1.5 Litre EcoBoost 4 Cylinder that offers 179hp with automatic start/stop that's mated to a paddle-shifted 6 Speed Automatic transmission for easy passing. Our Four Wheel Drive Escape handles beautifully with precise steering, impressive response, agility, and near 7.8L/100km on the open road. This Escape SE turns heads, check out the prominent hexagonal upper grille, sparkle-silver wheels, dual chrome exhaust tips, fog lamps, sculpted hood, and athletic stance. The SE interior greets you with plenty of cargo-carrying capacity to accommodate your next adventure, as well as amenities such as 60/40 split-fold-flat rear seatbacks, a 10-way power driver seat, a rearview camera, AM/FM/CD/MP3, available satellite radio, and SYNC Enhanced Voice Recognition Communication and Entertainment System. Carefully constructed, Ford Escape offers peace of mind with advanced airbags, stability control, available SOS post-crash alert, tire pressure monitoring and traction control. MyKey even lets you customize features such as speed and volume controls for the young drivers of the family. Delivering versatility, utility, efficiency, and style, our Escape SE is a terrific choice! Print this page and call us Now... We Know You Will Enjoy Your Test Drive Towards Ownership! Blackstock is proud to be a premier Ford and Lincoln dealership in the Orangeville, Ontario area. From the moment you walk into our showroom, you'll know our commitment to customer service is second to none. Whether you need to purchase, finance, or service a new or pre-owned Ford or Lincoln, you've come to the right place. Contact Blackstock Ford Lincoln today for information on dozens of vehicles like this 2019 Ford Escape SEL. Want more room? Want more style? This Ford Escape is the vehicle for you. Take home this Ford Escape SEL, and you will have the power of 4WD. It's a great feature when you need to drive over tricky terrain or through inclement weather. You can finally stop searching... You've found the one you've been looking for. This is about the time when you're saying it is too good to be true, and let us be the one's to tell you, it is absolutely true. Our 2019 Ford Escape SEL 4WD in Ingot Silver is better than ever! Powered by a TurboCharged 1.5 Litre EcoBoost 4 Cylinder generating 179hp with automatic start/stop that's mated to a paddle-shifted 6 Speed Automatic transmission. Our Four Wheel Drive Ford SUV handles beautifully with precise steering, awesome response, agility, and near 7.8L/100km on the open road. This Escape SEL turns heads, check out the prominent hexagonal upper grille, sparkle-silver wheels, dual chrome exhaust tips, fog lamps, sculpted hood, and athletic stance. The SEL interior greets you with plenty of cargo-carrying capacity to accommodate your next adventure, as well as amenities such as 60/40 split-fold-flat rear seatbacks, a 10-way power driver seat, dual climate control, a rearview camera, AM/FM/CD/MP3, available satellite radio, and SYNC Enhanced Voice Recognition Communication and Entertainment System. Carefully constructed by Ford, Escape offers peace of mind with advanced airbags, stability control, SOS post-crash alert, tire pressure monitoring, and traction control. MyKey even lets you customize features such as speed and volume controls for the young drivers of the family. Delivering versatility, utility, efficiency, and style, our Escape SEL is a terrific choice! Print this page and call us Now... We Know You Will Enjoy Your Test Drive Towards Ownership! Blackstock is proud to be a premier Ford and Lincoln dealership in the Orangeville, Ontario area. From the moment you walk into our showroom, you'll know our commitment to customer service is second to none. Whether you need to purchase, finance, or service a new or pre-owned Ford or Lincoln, you've come to the right place. Our 2019 Ford Escape SEL 4WD in Lightning Blue is better than ever! Powered by a TurboCharged 1.5 Litre EcoBoost 4 Cylinder generating 179hp with automatic start/stop that's mated to a paddle-shifted 6 Speed Automatic transmission. Our Four Wheel Drive Ford SUV handles beautifully with precise steering, awesome response, agility, and near 7.8L/100km on the open road. This Escape SEL turns heads, check out the prominent hexagonal upper grille, sparkle-silver wheels, dual chrome exhaust tips, fog lamps, sculpted hood, and athletic stance. The SEL interior greets you with plenty of cargo-carrying capacity to accommodate your next adventure, as well as amenities such as 60/40 split-fold-flat rear seatbacks, a 10-way power driver seat, dual climate control, a rearview camera, AM/FM/CD/MP3, available satellite radio, and SYNC Enhanced Voice Recognition Communication and Entertainment System. Carefully constructed by Ford, Escape offers peace of mind with advanced airbags, stability control, SOS post-crash alert, tire pressure monitoring, and traction control. MyKey even lets you customize features such as speed and volume controls for the young drivers of the family. Delivering versatility, utility, efficiency, and style, our Escape SEL is a terrific choice! Print this page and call us Now... We Know You Will Enjoy Your Test Drive Towards Ownership! Blackstock is proud to be a premier Ford and Lincoln dealership in the Orangeville, Ontario area. From the moment you walk into our showroom, you'll know our commitment to customer service is second to none. Whether you need to purchase, finance, or service a new or pre-owned Ford or Lincoln, you've come to the right place. Enhance your journey in our 2019 Ford Escape SEL 4WD in Lightning Blue! Powered by a TurboCharged 1.5 Litre EcoBoost 4 Cylinder generating 179hp with automatic start/stop that's mated to a paddle-shifted 6 Speed Automatic transmission. Our Four Wheel Drive Ford SUV handles beautifully with precise steering, awesome response, agility, and near 7.8L/100km on the open road. This Escape SEL turns heads, check out the prominent hexagonal upper grille, sparkle-silver wheels, dual chrome exhaust tips, fog lamps, sculpted hood, and athletic stance. The SEL interior greets you with plenty of cargo-carrying capacity to accommodate your next adventure, as well as amenities such as 60/40 split-fold-flat rear seatbacks, a 10-way power driver seat, dual climate control, a rearview camera, AM/FM/CD/MP3, available satellite radio, and SYNC Enhanced Voice Recognition Communication and Entertainment System. Carefully constructed by Ford, Escape offers peace of mind with advanced airbags, stability control, SOS post-crash alert, tire pressure monitoring, and traction control. MyKey even lets you customize features such as speed and volume controls for the young drivers of the family. Delivering versatility, utility, efficiency, and style, our Escape SEL is a terrific choice! Print this page and call us Now... We Know You Will Enjoy Your Test Drive Towards Ownership! Blackstock is proud to be a premier Ford and Lincoln dealership in the Orangeville, Ontario area. From the moment you walk into our showroom, you'll know our commitment to customer service is second to none. Whether you need to purchase, finance, or service a new or pre-owned Ford or Lincoln, you've come to the right place. Our 2019 Ford Escape SEL 4WD in Agate Black is better than ever! Powered by a TurboCharged 1.5 Litre EcoBoost 4 Cylinder generating 179hp with automatic start/stop that's mated to a paddle-shifted 6 Speed Automatic transmission. Our Four Wheel Drive Ford SUV handles beautifully with precise steering, awesome response, agility, and near 7.8L/100km on the open road. This Escape SEL turns heads, check out the prominent hexagonal upper grille, sparkle-silver wheels, dual chrome exhaust tips, fog lamps, sculpted hood, and athletic stance. The SEL interior greets you with plenty of cargo-carrying capacity to accommodate your next adventure, as well as amenities such as 60/40 split-fold-flat rear seatbacks, a 10-way power driver seat, dual climate control, a rearview camera, AM/FM/CD/MP3, available satellite radio, and SYNC Enhanced Voice Recognition Communication and Entertainment System. Carefully constructed by Ford, Escape offers peace of mind with advanced airbags, stability control, SOS post-crash alert, tire pressure monitoring, and traction control. MyKey even lets you customize features such as speed and volume controls for the young drivers of the family. Delivering versatility, utility, efficiency, and style, our Escape SEL is a terrific choice! Print this page and call us Now... We Know You Will Enjoy Your Test Drive Towards Ownership! Blackstock is proud to be a premier Ford and Lincoln dealership in the Orangeville, Ontario area. From the moment you walk into our showroom, you'll know our commitment to customer service is second to none. Whether you need to purchase, finance, or service a new or pre-owned Ford or Lincoln, you've come to the right place. Our 2019 Ford Escape SEL 4WD in Ruby Red is better than ever! Powered by a TurboCharged 1.5 Litre EcoBoost 4 Cylinder generating 179hp with automatic start/stop that's mated to a paddle-shifted 6 Speed Automatic transmission. Our Four Wheel Drive Ford SUV handles beautifully with precise steering, awesome response, agility, and near 7.8L/100km on the open road. This Escape SEL turns heads, check out the prominent hexagonal upper grille, sparkle-silver wheels, dual chrome exhaust tips, fog lamps, sculpted hood, and athletic stance. The SEL interior greets you with plenty of cargo-carrying capacity to accommodate your next adventure, as well as amenities such as 60/40 split-fold-flat rear seatbacks, a 10-way power driver seat, dual climate control, a rearview camera, AM/FM/CD/MP3, available satellite radio, and SYNC Enhanced Voice Recognition Communication and Entertainment System. Carefully constructed by Ford, Escape offers peace of mind with advanced airbags, stability control, SOS post-crash alert, tire pressure monitoring, and traction control. MyKey even lets you customize features such as speed and volume controls for the young drivers of the family. Delivering versatility, utility, efficiency, and style, our Escape SEL is a terrific choice! Print this page and call us Now... We Know You Will Enjoy Your Test Drive Towards Ownership! Blackstock is proud to be a premier Ford and Lincoln dealership in the Orangeville, Ontario area. From the moment you walk into our showroom, you'll know our commitment to customer service is second to none. Whether you need to purchase, finance, or service a new or pre-owned Ford or Lincoln, you've come to the right place. Our 2019 Ford Escape SEL 4WD in White Platinum is better than ever! Powered by a TurboCharged 1.5 Litre EcoBoost 4 Cylinder generating 179hp with automatic start/stop that's mated to a paddle-shifted 6 Speed Automatic transmission. Our Four Wheel Drive Ford SUV handles beautifully with precise steering, awesome response, agility, and near 7.8L/100km on the open road. This Escape SEL turns heads, check out the prominent hexagonal upper grille, sparkle-silver wheels, dual chrome exhaust tips, fog lamps, sculpted hood, and athletic stance. The SEL interior greets you with plenty of cargo-carrying capacity to accommodate your next adventure, as well as amenities such as 60/40 split-fold-flat rear seatbacks, a 10-way power driver seat, dual climate control, a rearview camera, AM/FM/CD/MP3, available satellite radio, and SYNC Enhanced Voice Recognition Communication and Entertainment System. Carefully constructed by Ford, Escape offers peace of mind with advanced airbags, stability control, SOS post-crash alert, tire pressure monitoring, and traction control. MyKey even lets you customize features such as speed and volume controls for the young drivers of the family. Delivering versatility, utility, efficiency, and style, our Escape SEL is a terrific choice! Print this page and call us Now... We Know You Will Enjoy Your Test Drive Towards Ownership! Blackstock is proud to be a premier Ford and Lincoln dealership in the Orangeville, Ontario area. From the moment you walk into our showroom, you'll know our commitment to customer service is second to none. Whether you need to purchase, finance, or service a new or pre-owned Ford or Lincoln, you've come to the right place.